Those were comments overheard from teen girls who had arrived to pick out free prom dresses at Durant-First United Methodist Church. A rainbow of formal dresses on racks, ranging in size from 0 to 24, greeted the girls who came to the event at the end of February. Church member Charla Hall said students from 13 area schools, in Bryan and Marshall counties, came to First UMC to pick out dresses to wear to their proms. Hall was one of the event organizers. Among the dresses were 300 donated by St. Andrew UMC in Plano, Texas. 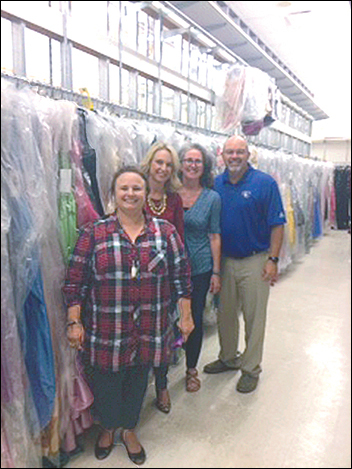 During a visit to that church, Hall and her husband, Tim Boatmun, got the idea to start the Prom Closet at their church in far southeastern Oklahoma. They noticed 100 girls standing in line for the prom dress giveaway at the Plano church. They started asking questions. Plano church leaders explained the project — and gave their support to Durant-First, including donating some dresses. Those beautiful dresses filled four SUVs when Durant church members went to pick them up, Hall said. Other people also donated dresses, including brand new ones, to the Durant project. The Prom Closet is "much needed in our area," said Heather Burrage, also one of the organizers. "There were lots of girls in our community who needed dresses." For the event, the evening gowns were displayed on racks in a hallway of the church, Burrage said. Shoppers also received gift bags containing water and items from First Church’s Evangelism Committee. The project was "a wonderful ministry," Burrage said. Durant-First hopes to make the Prom Closet a regular event, Hall said. After prom season in April and May, the church may have a prom dress drive to collect inventory, Burrage said. Planners want to add shoes and accessories. The church has been granted access to a storage building, where dresses will be covered in plastic and stored on racks until the next season. Members of Durant-First pose in front of prom dresses that were to be given to girls in Bryan and Marshall counties.